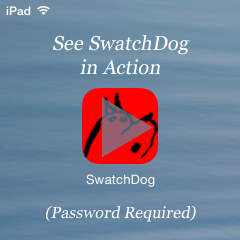 SwatchDog works with your iPad (including the iPad mini). The bluetooth scanner reads the barcode and sends it to the SwatchDog app on your iPad. Verification is sent back to the scanner screen for easy reading. No need to look at the iPad. The scanner beeps to indicate fabric status, and even vibrates on drops! Responses include: Current / Discontinued / Grade Change / Duplicate (pattern scanned previously) / Move pattern to different collection. Your iPad just needs to be in bluetooth range - but not necessarily right there with you. The scanner in your hand tells you everything you need to know. The system is wifi connected, but works just fine in locations with no internet or wifi. * iPad 1 is no longer supported by Apple or SwatchDog. * At present, SwatchDog works with most iPhones. We do not promise to maintain compatibility with iPhones, but will not eliminate it without good reason. This is a very special scanner. 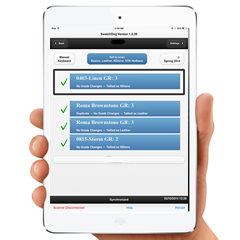 It not only sends scans to the iPad, it receives information back from our SwatchDog app which is displayed on the scanner LCD screen. This is a key feature for speed and ease of use. The scanner is light, fast, has extended run time and charges quickly. It has a beeper and vibrates to quickly communicate fabric status, allowing you to speed through fabrics. SwatchDog is ALL ABOUT SPEED! The scanner is 395.00 plus shipping and applicable taxes. Expected charge cycles on rechargeable battery - 1000+ / Replaceable battery (around 50.00 installed). Don't be fooled by the cheaper bluetooth scanners, they are one way "dumb" keyboards. It's fast - much faster than the 3rd gen Symbol scanner. It's light - smaller and lighter than a standard feature phone. Runs all day. - Flexible charging via car plug (included), USB to computer cable (included), or wall plug (included), or most any USB charging source. You can operate concurrent sessions. (Visit store #1, visit store #2, then go back and continue store #1). Grade change notifications enhanced control. You can choose to only be notified of grade changes that have occurred since your last visit to a particular location. Easy to use and understand - The large screen of the iPad reduces crowding of features into abbreviated spaces. Always up to date - wireless connection updates fabric changes as they occur, even if changes occur daily. Enhanced Missing Fabric Reports - preview the lists and easily edit prior to running and emailing the reports. Does not require WiFi or internet connection to scan fabrics, only to email fabric reports and refresh fabric data. Easy manual keying of patterns that don't have barcodes with speedy filter and touch selection. No PC or Mac required - PERIOD! SwatchDog began way back in 1992. Our hardware was boxy (but wonderful) and created fabric lists on thermal fax paper. To update the fabric data, the memory modules were mailed in and had to bake in an ultraviolet oven for 30 minutes to erase. Nothing was wireless. The entire hardward setup back then cost $2400.00 (and was well worth it!). Four generations of hardware later we have a real time connected cloud device that is the fastest and easiest to use system yet. It is also the most economical to own. Our servers import master fabric data directly from your factory and distribute it seamlessly to keep SwatchDog current. The resulting missing fabric lists are emailed directly from your iPad. Not only do you get a great system, you get a service that is operated by knowledgable people who have specialized in this solution for their entire careers. We know what really happens out there and design our systems to be flexible and efficient. Noone at the home office needs to worry about the operation, technical support, or updating of the system, we take care of it all. Contact Us Let us to do a live demonstration!